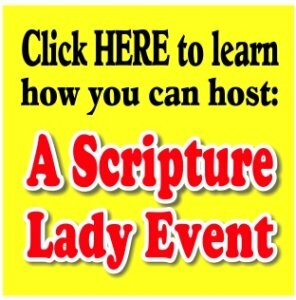 Scripture Lady's Bible Song Program: Let's GROW in God! Scripture Lady’s Bible Song Program: Let’s GROW in God! Invite the Scripture Lady to present her elementary Bible song program “Let’s GROW in God!” – a fun Scripture-filled musical presentation for the spiritual growth of children. Do your kids know that growing in God is as simple as G-R-O-W? It’s true. G – Going to church or a Bible-believing Bible study. R – Reading the Bible and Praying every day. O – Obeying God and doing what He says. W – Witnessing or telling others about Jesus. Let the Scripture Lady come and share these practical and fun steps to growing in their friendship with God. “Let’s GROW in God” is filled with lively Bible verse songs, Bible games and an “electrifying” object lesson on prayer. Watch this presentation of the GROW Talk. The Scripture Lady begins with one of her favorite Bible verse songs, “Know-ow-ow,” from Psalm 100:3, which says, “Know that the Lord is God. It is He who made us and we are His. We are His people, the sheep of His pasture.” This verse shows the kids that there is so much that God wants us to know about Him. He wants us to grow in our relationship with Him. The next point of growth comes from the letter “R” – Read your Bible and pray every day. The Scripture Lady loves singing how the Word of God is living and active and sharper than any double-edged sword. (Hebrews 4:12) She also loves talking about the importance of prayer in our lives especially when sharing a “bright” presentation of an object lesson that uses a prop called “The Energy Stick.” Of course, this is a great time to sing “The Lord’s Prayer”, African style! The letter “O” will remind your children to obey God and do what He says. Soldiers are very good at obeying their commanding officer and we are to obey Almighty God. Put these two truths together and you have an audience favorite when singing “Be On” from 1 Corinthians 16:13. Next, the children get to compete with each other as they play “Bible Password” to help them learn about obedient and faithful people of the Bible.